NOTE: This edition features the same content as the traditional text in a convenient, three-hole-punched, loose-leaf version. Books a la Carte also offer a great value-this format costs significantly less than a new textbook. Before purchasing, check with your instructor or review your course syllabus to ensure that you select the correct ISBN. Several versions of Pearson's MyLab & Mastering products exist for each title, including customized versions for individual schools, and registrations are not transferable. In addition, you may need a Course ID, provided by your instructor, to register for and use Pearson's MyLab & Mastering products. 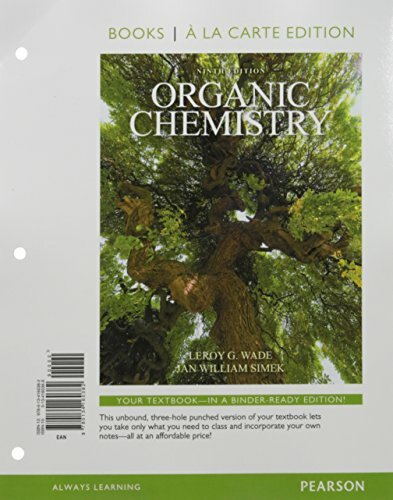 Wade & Simek's Ninth Edition of Organic Chemistry presents key principles of organic chemistry in the context of fundamental reasoning and problem solving. Authored to complement how students use a textbook today, new Problem Solving Strategies, Partially Solved Problems, Visual Reaction Guides and Reaction Starbursts encourage students to use the text before class as a primary introduction to organic chemistry as well as a comprehensive study tool for working problems and/or preparing for exams. With unparalleled and highly refined pedagogy, this Ninth edition gives students a contemporary overview of organic principles and the tools for organizing and understanding reaction mechanisms and synthetic organic chemistry. Mastering brings learning full circle by continuously adapting to each student and making learning more personal than ever--before, during, and after class. Jan Simek was born to humble coal-mining parents who taught him to appreciate the importance of carbon at a very early age. At age 14, he was inspired to pursue a career teaching chemistry by his high school chemistry teacher, Joe Plaskas. Under the guidance of Professor Kurt Kaufman at Kalamazoo College, Dr. Simek began lab work in synthesis of natural products that turned into research in hop extracts for the Kalamazoo Spice Extraction Company. After receiving a master’s degree from Stanford University, Dr. Simek worked in the pharmaceutical industry, synthesizing compounds designed to control diabetes and atherosclerosis, and assisted in the isolation of anti-cancer antibiotics from natural sources. Returning to Stanford University, Dr. Simek completed his Ph.D. with the legendary Professor Carl Djerassi, who developed the first synthesis of steroidal oral contraceptives. Dr. Simek’s 35-year teaching career was spent primarily at California Polytechnic State University, San Luis Obispo, where he received the university’s Distinguished Teaching Award. Other teaching experiences include Albion College, the University of Colorado at Boulder, Kalamazoo College, and the University of California at Berkeley. In addition to his pharmaceutical research, he has industrial experience investigating dyes, surfactants, and liquid crystals, and he continues to consult for the biotechnology industry. Although his outside interests include free climbing in Yosemite, performing in a reggae band, and parasailing over the Pacific, as close as he gets to any of those is tending his backyard garden with his wife Judy.